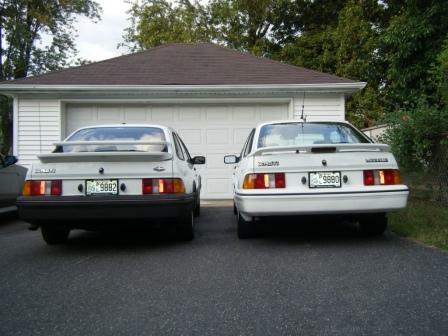 jasonty wrote: What about the "XR4Ti" stickers on the doors ala Kate Ertls cars? 1988 Black , it is a late 88 though Chris, are you saying they changed the interior fabric style before the 86MY? I have a 5/85 that has the original window-pane style. Black cladding strip in an mono white 88? I'm going to guess that car also has the BBS-stlye wheels on it then? Seems like all black trim mono-whites have the BBS and the silver trim mono-whites have the spatulas. Bingo, I've always called the cars with BBS style wheels 88.5's.. I actually kind of like the silver trim on them though..
grondie wrote: Chris, are you saying they changed the interior fabric style before the 86MY? I have a 5/85 that has the original window-pane style. I'm pretty sure the fabric change occured in the middle of 85 somewhere. I think there are 85s with the herringbone fabric. Then again, the car with the window-pane fabric was sold to me as an 86. Hrm. Here's a functional question. I'm (obviously) hosting my "change" pictures away from the MCA server. In the event that I fall off the face of the earth, my pictures go away. Is there a way we can host the pictures from this topic on the MCA web space once we get the details nailed down? My 1985 was built in 6-1985 I have the checkerboard gut so what year did the change over happen in? 85's have a larger courtesy light in the kickpanel than the 86's. merkurdriver wrote: Black cladding strip in an mono white 88? I'm going to guess that car also has the BBS-stlye wheels on it then? Seems like all black trim mono-whites have the BBS and the silver trim mono-whites have the spatulas. Hmmm, not sure that's correct Mike, but I'm not 100% on this one. 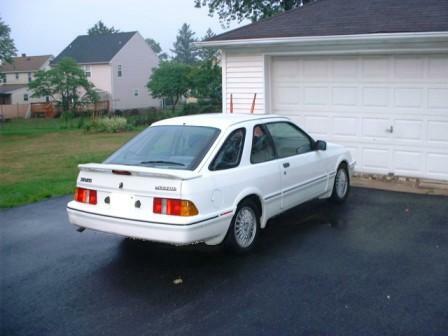 I think my 3/88 white car had spatulas originally, and it has the black trim stripe. My 7/87 mono-white car had the maroon stripe. Incidentally, 3/88 automatic cars got the 150 speedo face, while that didn't seem to happen on the 5-speed cars until 4/88. My 3/88 5-speed had a 85 MPH speedo face. Last edited by DPDISXR4Ti on Sun Aug 02, 2009 2:43 pm, edited 1 time in total. I'm pretty sure the fabric change occured in the middle of 85 somewhere. I think there are 85s with the herringbone fabric. I'm gonna wave the BS flag on this one. I've never seen an original '85 with the herringbone fabric. Never. aviatorpa23 wrote: No wing - and can not find evidence that this hatch ever had a wing installed - nor do the mounting bolts look like they have ever had a wrench on them - but if no XRs ever shipped without a wing, I suspect that this is a replacement hatch and a wing was never mounted to it. Paint looks very orginal, but then there are artists out there with a paint gun. Right. No XR ever came from the factory without ANY wing. The hatch/wing change was one item that was tightly tied to the '87 -- '88 model year change-over. All '87 M.Y. are bi-wing "small glass"; all '88 M.Y. are mono-wing "large glass". The "MERKUR" script on the rear hatch however arrived early, replacing the badge. All 7/87 cars (these would all be 1987 M.Y. ), have the script. Anyone with a 6/87 car? When did the upgrade to the T-9 occur when it got the removable counter-shaft retainer? 9/86 (early '87 M.Y.) was still the "old" style. By 3/87 the new one had arrived. Note, although an upgrade, the removable retainer provided one more location for a leak to develop! DPDISXR4Ti wrote: My 7/87 mono-white car had the maroon stripe. 87.5 bi-wing car or 88 single wing car? If its a bi-wing 87.5 that totally makes sense, but if its a 88 single wing with the maroon stripe that would be interesting. DPDISXR4Ti wrote: I've never seen an original '85 with the herringbone fabric. Never. merkurdriver wrote: ... but if its a 88 single wing with the maroon stripe that would be interesting. I don't have the originals of these pictures. IIRC, the car belonged to a guy who had a pretty serious underhood fire which totalled the car. I snagged the pics a few years ago (pre-2000-ish) and then cut the burned parts of the car out of the picture so I could use them here. The fact that the pictures are so old is the only reason why I think that this might be a legitimate combination/unmolested example.